The first fishing lure I owned was a black Arbogast Jitterbug. My uncle Julius gave it to me, along with a lesson on nighttime bassing. “This lure’s made especially for catching bass at night,” he said. “It makes a gurgling noise on top of the water, so bass can hear it. Because it’s black, they can see it better in the dark. It seems like a white lure would be better at night, but it’s not. When that ol’ bass is looking up toward a moonlit sky, that black Jitterbug stands out like a sore thumb. And when it goes splashing across the surface, he’s gonna hit it like a freight train. More than 40 years have passed since that night, but the events are branded on my mind. I cast the Jitterbug past the tree, then began a slow, steady retrieve. The Jitterbug sang bass music—plop, plop, plop, plop—as it wiggled across the water. Then suddenly, the water beneath the lure boiled. My rod snapped downward, nearly leaving my hands. A hard hook-set met with furious resistance, but five minutes later I had the scoundrel on the bank. Uncle Julius had an ear-to-ear grin when I woke him to show the 8-pound largemouth, and from that night forth I was a confirmed nighttime bass fisherman. Because summer bass are often most active after dark, it’s important for hot-weather anglers to understand the ins and outs of night fishing. 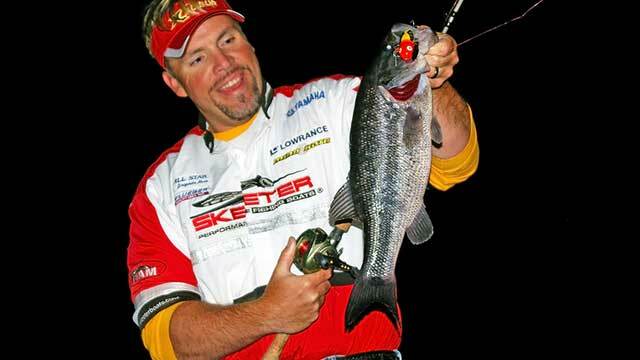 That bass become largely nocturnal during summer is common knowledge. But many fishermen have little knowledge of nighttime fishing techniques. Almost any body of water you normally fish during the day will make an excellent nighttime prospect. In fact, the more familiar you are with a body of water, the better chance you have of scoring at night. You already know where fish are likely to be; it’s simply a matter of being there after the sun sets. Night-feeding bass rely heavily on their lateral lines to detect vibrations from prey animals. Thus, baits that disturb the water (chuggers, crawlers, buzzbaits, etc.) help the fish locate the lure. Many night anglers choose to fish on calm lakes under a full moon. A placid lake lets you hear bass feeding and allows fish to easily locate your bait. The moon helps you to see the shoreline and structure better, so you can make more accurate casts. Such was the situation on a night-fishing excursion I enjoyed last year. On this trip, we fished primarily with chugger plugs. Chuggers, or poppers, have a concave mouth designed to catch water and make loud pops when worked on top. Examples include the Rebel Pop-R, Cabela’s Top Popper, Creek Chub’s Knuckle Head and Berkley’s Frenzy Popper. We fished the edges of lily pads in the lake, casting a chugger close to cover and letting it sit motionless a few seconds. Then, keeping our rod tip low and line slack, we jerked the lure to make a loud chugging sound. When the ripples seen in the moon’s reflection subsided, we jerked the lure again and repeated the process. Bass usually struck when the chugger hit the water or was motionless. By keeping tight lines, we were ready to strike when one hit. Three hours of fishing produced 24 largemouths, including two 7-pounders. Your chugger will snag fewer weeds and branches if you make some minor adjustments first. I like to trim the front point of each treble hook with wire cutters. Position each treble so only one point of each hook aims forward, then cut off the front point. This turns each treble hook into a double hook. The hooks now ride with points up and slide more easily over weeds and limbs. Crawlers are my favorite lures for nighttime bass. These have a large face plate or side wings that make the lure sputter back and forth when retrieved across the surface. Examples include the Arbogast Jitterbug and Heddon Crazy Crawler. I usually fish these lures along edges of aquatic vegetation such as lily pads and milfoil. Retrieval speed is critical. Too slow, and the crawler won’t make the gurgling sound that attracts bass. Too fast, and the lure hydroplanes with no action. The best speed produces a pronounced wobble and loud gurgle. But if bass ignore a steady retrieve, add an occasional pause or twitch. Fishing topwaters isn’t the only way to catch nighttime bass. Brad Wiegmann who guides on Arkansas’ Beaver Lake (www.bradwiegmann.com) shared some of his successful night-fishing techniques. Remember that proper pre-trip preparation can spell the difference between a good night-fishing trip and a bad one. You should plan for the unique conditions encountered when night-fishing. Make sure running lights on your boat are working properly, both bow and stern. Carry a flashlight or spotlight to signal your presence if another boat should approach you. Wear a lifejacket and kill switch at all times. Organize your gear before leaving home. Clean out unnecessary equipment. Have two poles rigged and ready to go. Organize your tacklebox, so you’ll know exactly where everything is. Carry extra lantern fuel and mantles, anchors with an adequate length of rope to hold your boat stationary, marker buoys to pinpoint fishing holes and plenty of insect repellent. Know exactly where you’ll fish when darkness falls. Prospect during daylight hours, and be sure you can find each fishing spot after nightfall if you leave and return. Select alternate sites in case of a change in plans. Give night-fishing a try. It’s the best way to catch bass when the heat is on in the summer months.